Cancellation later than 30 days before will be charged with 100% of the full stay. 100% of the stay will be charged 30 days before check in. A deposit of 100,-€ per room will be required in cash upon check in. Don't hesitate to ask us for breakfast, lunch, guided tours, tickets for public transportation prior to arrival. 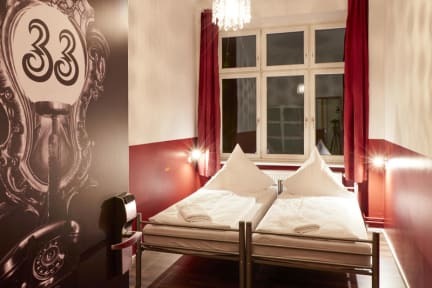 At the location of Berlin’s oldest hostel Ballhaus Berlin Hostel awaits you an unique old brick building which also hosts Berlin’s oldest ballroom, and now also one of Berlin’s oldest pubs, the infamous Alt-Berlin which invites hostel guests and locals alike on 6 days of the week. With a long history of hosting travelers from all over the world. A meeting point for the creative, music lovers, culture and history fans alike. Carrying on the tradition of the ballroom downstairs, our theme ranges from the previous “golden 20’s” to the upcoming 20’s. 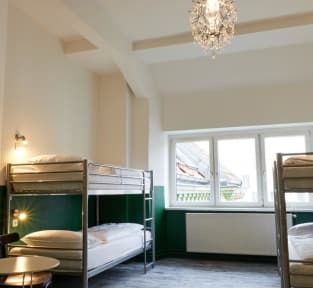 Our hostel Ballhaus Berlin Hostel is located in the district Mitte, literally meaning 'the middle' and being a contraction of Stadtmitte (city center), contains the historical heart of Berlin and represents in many ways the real center of the city. It is here where you will find the vast majority of the most popular sights, museums, and theatres. Fans of history, art, and culture will feel right at home. Right around the corner you’ll find the Naturkundemuseum (Natural History Museum) and Berlin Wall Memorial. Also the central train station is in walkable distance. With a short trip by public transport you’ll find shopping at Alexanderplatz, the Brandenburger Gate, and Museum Island. There are many places for a quick lunch, enjoyable dinner and relaxing drinks in the evening. In about 30 minutes by public transport you can get to the club and party districts of Friedrichshain und Kreuzberg. Ostello situato a una 30ina di minuti a piedi da Alexanderplatz, ha una fermata di metro vicina all'ostello. Camerate molto carine, personale gentile, mi sono trovata bene e come qualità/prezzo direi ottimo! Ha una cucina comune e un salottino dove chi vuole può mettersi a suonare il piano o la chitarra. Penso che tornerò lì per i miei prossimi viaggi a Berlino. Close to tube subway, to the main train station and most of monuments and history places. Clean, friendly staff!! Has no facilities, bed was comfortable. Showers have water too hot and can’t regulate temperature. If your room is on the front side you hear noise from the pub downstairs (only if it is crowed or with open windows ). I would came back. Nice and cheap place. One suggestion to the owner: the lights on the beds are too strong and enlights the other guests. This is extremely annoying and makes these lights almost useless. The bad part: one toilet per floor is absolutely not enough.